Is it going to rain today? Here in the meteorologically capricious Midwest, this might be the most commonly asked question on any given day. The answer is always the same, whether you ask your next door neighbor, the lifeguard at the pool or the local TV weather personality. It might. Given how much it affects our daily lives, it’s remarkable how much trouble modern science has predicting if it’s going to rain. In Rain, a wide-ranging and entertaining exploration of Earth’s life sustaining liquid precipitation, journalist Cynthia Barnett reveals much about humanity’s never ending quest to understand the weather. Starting out in the consistently moist Pacific Northwest, Barnett spends much of the book traveling to some of the most notoriously rainy spots on the planet, from Miami to Manchester to Meghalaya, the rainiest state in India. 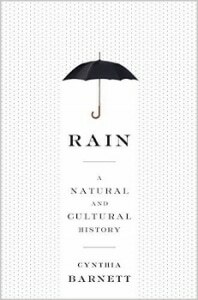 In the process she tells of the birth of meteorology, the invention of the raincoat and the many ways rain has influenced human culture from literature to perfume. She also explores how the absence of rain has had an equally profound effect on history, focusing on the European settling of the dry western half of North America in the 19th century and the modern struggles of parched metropolises like Los Angeles and Phoenix. 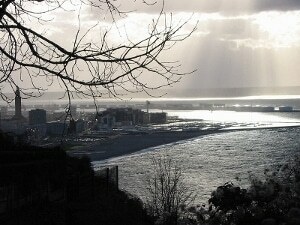 A rainy day in France. Informative, interesting and full of plenty of damp trivia, the book is a consistently enjoyable read, even if it’s only about one of the simplest of molecules. From the birth of human civilization to the impending anthropogenic climate crisis, the author covers a lot of muddy ground. Additionally, Barnett takes frequent breaks to appreciate some of the aesthetically profound aspects of a rainy, stormy or soggy day, deftly capturing the beauty of a dripping wet rainforest or the unrelenting deluge of the annual monsoon. 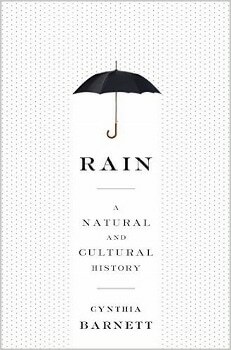 A refreshing addition to my growing list of monosyllabic geek books, Rain is a surprisingly interesting look at a seemingly mundane topic. Whether you live in a city as wet as Mobile, Alabama or as dry as Yuma, Arizona, you’re likely to find plenty to make you appreciate the consistent challenges presented by weather of every sort. Recommended for anyone who likes to keep an eye on the sky.